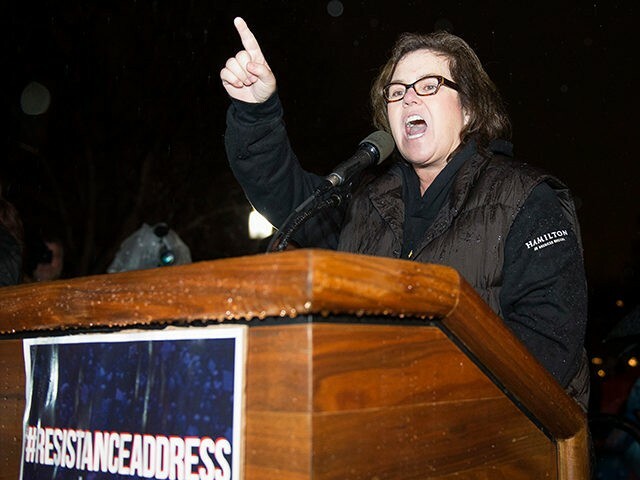 WASHINGTON, D.C. — Comedian-turned-political activist Rosie O’Donnell said she would like to share a souvlaki with leftist billionaire George Soros Tuesday night during a protest of President Donald Trump’s first joint address to Congress. Souvlaki is a traditionally Greek dish. Soros hails from Hungary. O’Donnell suggested the date while addressing approximately 300 progressives who braved the rain in Lafayette Park, across from the White House. She said a man asked her if Soros paid her to attend the anti-Trump rally on her way to the event. Soros has openly funded several groups associated with anti-Trump protests and movements. O’Donnell said she’s only met Trump twice. Once at his wedding to Marla Maples where she said Trump “shook the hands of the guests at the wedding as he walked down the aisle to take his vows. Warning! Warning! Warning Will Robinson!” She met him on a game show the second time. “Nyet” means “no” in Russian. “No we won’t,” O’Donnell said. “We have seen what you have done, sir. We have seen your connection with Russia. The game is over. The Internet rules.” She chanted, “He lies! He lies! He lies! He lies!” setting several other women in the crowd off to repeat her words. Speakers from the event included the ACLU, DailyKos, Food & Water Watch, MoveOn.org, Our Revolution, and National Nurses United, among others.